It turns out 2017 was a banner year for mortgages, just not all of them. A total of $1.148 trillion in home purchase mortgages were funded last year, the highest total since 2006, per new data from Inside Mortgage Finance. I guess if we consider inflation, and the fact that it has been over a decade, the numbers aren’t as peachy as they look. Still, the 2017 home purchase mortgage origination tally was up a sizable 10.7% from 2016, thanks in part to first-time home buyers, who appear to be replacing real estate investors in what might be the later stages of this massive real estate rally. If you recall, home prices peaked in 2006, and then tanked, hard, before beginning to recover in 2012. We’re now flying high again, and some folks are worried we might be headed toward another housing crash. More on that in a minute. These first-timers accounted for nearly half (48.6%) of purchase mortgages backed by Fannie Mae, Freddie Mac and Ginnie Mae (FHA loans and VA loans). Loan volume for first time buyers was up 4.1% from 2016, while volume for repeat buyers inched up a mere 0.3%. This might be a testament to the difficulty in moving up to a larger home or even downsizing at the moment. While home purchases ended the year nicely, mortgage refinances didn’t fare so well. Total home refinance activity plummeted 35.6% from 2016 numbers to an estimated $662 billion. Overall, home purchase mortgages grabbed 63.4% of the mortgage market last year, which wasn’t unexpected, seeing that rate and term refinances have largely dried up, and most homeowners have yet to really get into the whole cash out refinance game again. Speaking of cash out, Freddie Mac noted this week that adjusted for inflation in 2017 dollars, an estimated $14.8 billion in home equity was cashed out when refinancing a conventional prime-credit home mortgage in the fourth quarter. That was down from $19.0 billion a year earlier, and not even in the same galaxy as the peak cash out refinance volume of $102.3 billion seen during the second quarter of 2006. So sure, purchase mortgages are up, and home prices are up, but cash out refinancing is a blip. And that’s probably a good thing, at least for now. After all, stripping properties of every last drop of home equity was one of the reasons we saw the worst mortgage crisis in decades. What Does 2018 Hold for the Housing Market? I’m pretty optimistic, though I know lending shops that rely mostly on refinances will have a tough time. We’ve already seen some industry layoffs and consolidation, and we’ll probably see even more as the months go by. But home sales might register yet another good year, despite major inventory constraints. That’s actually what makes the 2017 numbers so impressive. There are very few homes for sale, yet figures were still the best in more than a decade. 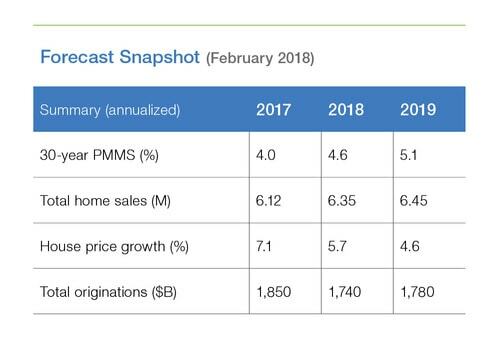 Freddie Mac Deputy Chief Economist Len Kiefer expects new home sales to push total home sales even higher in 2018, despite some weakness with existing home sales. The most recent Freddie Mac House Price Index (HPI) also revealed that U.S. home prices increased 7.1% from December 2016 to December 2017, with more gains on the way. Despite higher mortgage rates and some potentially unfavorable tax changes, Kiefer sees continued price gains as home builders slowly build more homes to meet demand, which is still far stronger than existing supply. In other words, don’t expect a discount in 2018, or less competition. If anything, you might experience an even more competitive housing market this year than last. Firsthand, I’m seeing a lot of fence-sitters finally dive in, so I’m assuming this is a trend that’s happening nationwide. Ironically, the increase in mortgage rates is just exacerbating this issue. Maybe that’s why home prices don’t go down when mortgage rates go up, despite the seemingly obvious logic. I’m still playing contrarian and expecting mortgage rates to fall over the coming months. That goes against pretty much everyone out there, other than maybe Fannie Mae and Freddie Mac, who see this possibility as well per their 2018 mortgage rate forecast. 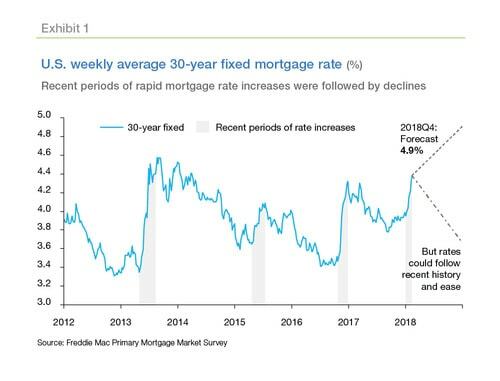 The chart above from their monthly outlook highlights the fact that rapid mortgage rate increases are often followed by periods of declining rates. No one can deny the fact that mortgage rates have shot up recently, so it might be wise to sit back and let the dust settle. This is actually one of my home buying tips for 2018 – to wait. I think the spring home buying season is going to be brutal, with both high home prices and elevated interest rates. Why not sit back, get a mortgage pre-approval, season some assets in your bank account for down payment, closing costs, and reserves, and just bide your time? Read more: 11 tips for home buyers in 2018.